After our big Thanksgiving day meal, we took a few days off from turkey. So, last night and tonight I wanted to get through the leftover turkey. 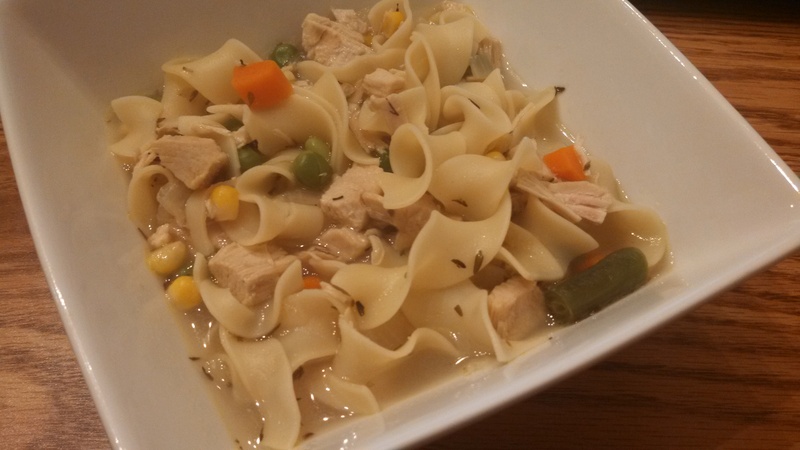 Turkey Pot Pie and Turkey Noodle Soup. Both turned out well! And were rather easy to put together. Melt butter in a large pot over medium heat. Add onions and cook until soft and translucent. Add turkey. Sprinkle in flour, thyme, salt, and pepper. Stir constantly and cook for about 5 minutes. Pour in broth and milk, continuing to stir to avoid lumps forming. Stir in the frozen vegetables. Bring to a boil over medium heat, and continue and continue to cook for about 5-10 minutes, until mixture thickens. Pour mixture into a 2 quart round casserole dish. 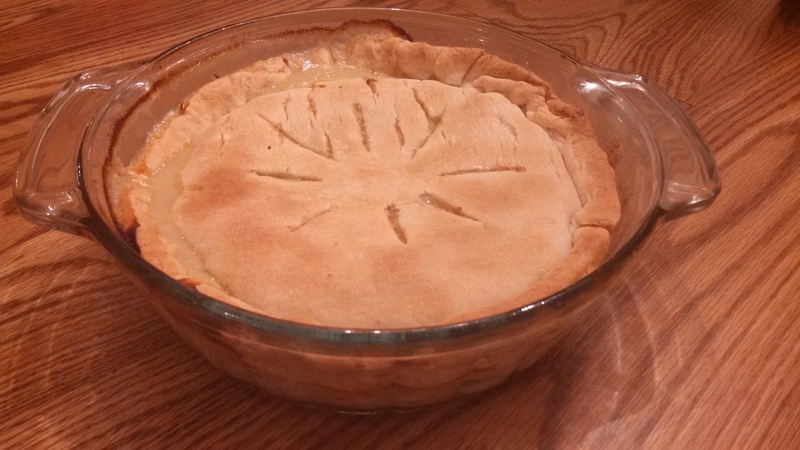 Place the pie crust over the top of the mixture and press crust into the sides of the dish. Cut vents in the crust. Bake in the preheated oven for 30-40 minutes, or until crust is golden and mixture is bubbly. Let stand for 5-10 minutes to cool before serving. Melt butter in a large pot over medium heat. Add onion and cook until soft and translucent. Add turkey. Pour in turkey or chicken broth. Sprinkle in thyme, salt and pepper. Bring to a boil, then reduce heat to medium low. Simmer for 20 minutes. Bring back to a boil. Add noodles to the pot. After 5 minutes, add frozen vegetables. Continue to boil for another 5 minutes, or until noodles are soft and vegetables are heated through. This is something I have made for a long time. But, my challenge tonight was to make it gluten-free for my friend’s kids that I was watching tonight. Normally, I make the Bisquick biscuit recipe on the box and drop it in, but tonight I used a biscuit recipe using flour so I could substitute in the gluten-free all-purpose flour that I have. 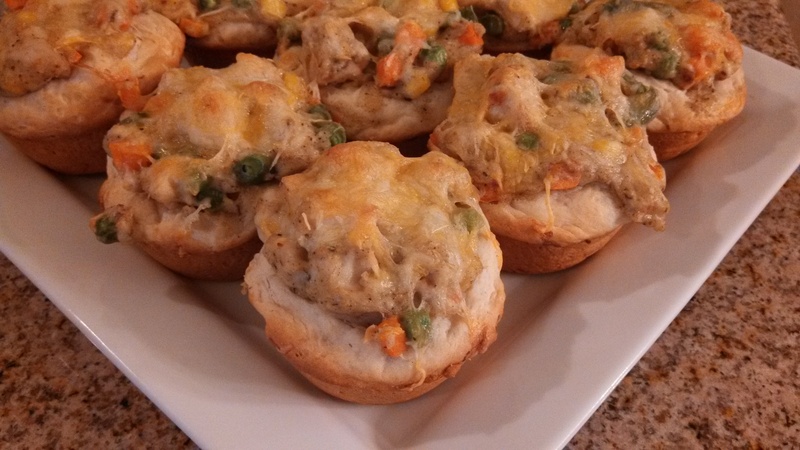 With the Bisquick, the dumplings end up pretty fluffy and it’s almost more like a chicken pot pie. 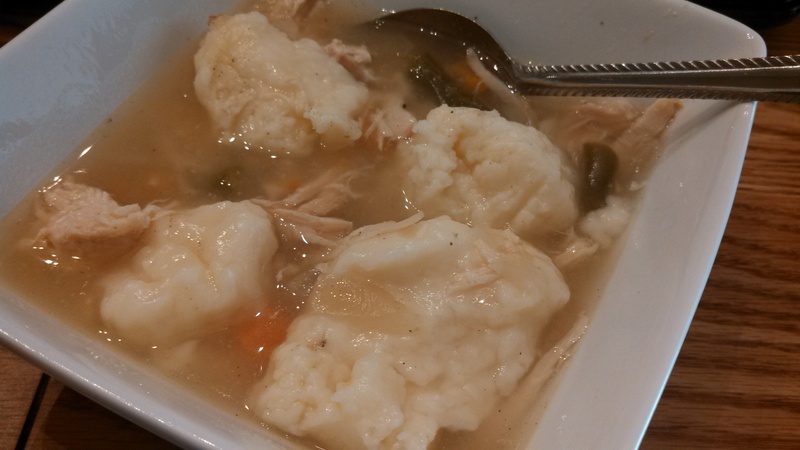 This time, it turned out more like dumplings, and was pretty good! So, now this can be made with regular flour or gluten-free flour with good results. Spray slow cooker with non-stick spray. Add chicken, vegetables, onion, water, chicken bouillon, and poultry seasoning. Cook on low for 6-8 hours or high for 3-4 hours. Remove chicken, shred, and return to crock pot. If cooked on low, turn to high for 15 minutes. Mix together flour, baking powder, oil, and milk. Drop dough by spoonfuls into the slow cooker. Cook on high 30 minutes more or until dumplings have cooked. Note: For the dumplings, you can also use regular or gluten-free Bisquick to make biscuit dough according to the box, then drop by spoonfuls into the slow cooler. If you don’t need gluten-free, you can use a can of refrigerated biscuit dough. Cut each biscuit into fourths and roll into balls, then drop then into the slow cooler. Once I saw a picture of these, I knew it was something I wanted to try. What’s funny is that 2 different friends on Facebook posted pictures with recipes that were similar, yet different. So, I picked this version to try first, and may try another version in the near future. I did modify from the original a bit. It called for a can of condensed cream of chicken soup, which I am not a fan of, so I substituted butter, flour, milk, and chicken broth. I also used 1 larger can of Grands biscuits, the can with 8 biscuits. I took about 1/3 out of each biscuit, and put 2 of the thirds together to make another biscuit, getting 12 biscuits in all. The whole family liked them! In a large skillet, heat some olive oil over medium high heat. Add chicken and cook until no longer pink inside and a little browned on the outside. Remove from skillet to a plate. In the same skillet, melt the butter. Stir in the flour, stirring continuously. Whisk in milk and chicken broth. Let it cook for a few minutes to thicken. Next, stir in the poultry seasoning, chicken, and mixed veggies. Remove from heat. Spray a 12 cup muffin tin with non-stick spray. Remove about 1/3 from each of the 8 biscuits and use the pieces to form 4 more biscuits, giving you 12 all together. Spread each biscuit into each muffin cup. Spoon the chicken mixture into each biscuit. Top each with shredded cheese. Bake in the preheated oven for 15 minutes, or until biscuits are golden brown. A couple of weeks ago, I picked up a 40 pound case of Zaycon Foods boneless, skinless chicken breasts like the case I got in March. A friend of mine came over with her case, and we worked on processing the cases together. She cut the butterfly breasts into 2 pieces, while I cooked dinner (bacon wrapped chicken stuffed with cream cheese and chives, with sweet potato chips as a side), grilled about half of each case, and got the FoodSaver bags ready. 5 hours later and we had 80 pounds of chicken processed! As she was cutting the breasts and removing extra fat, there were small chicken pieces that we set aside, my guess it was about 4 pounds worth. 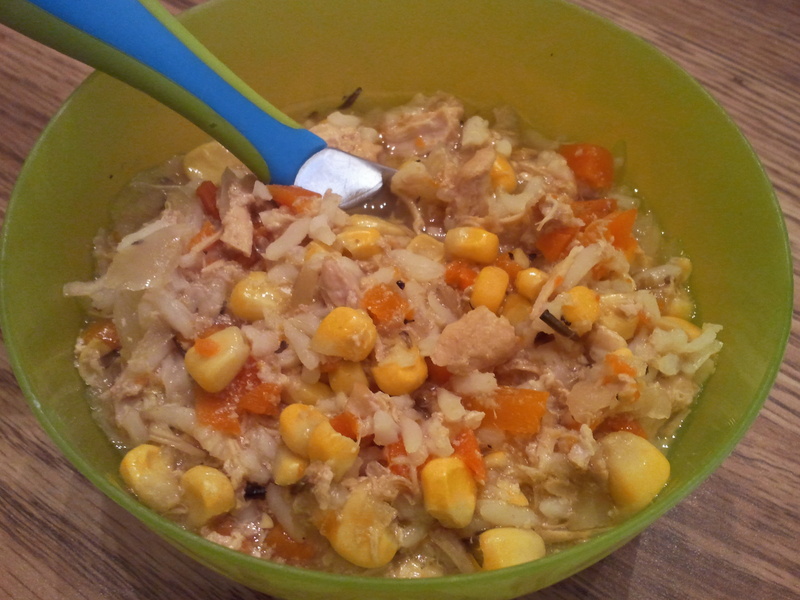 We decided it would be best for some kind of stew, so I decided on chicken and rice. I had onion, carrots, and corn in the freezer, so after a long night of prepping chicken, it was easy to throw this all in the slow cooker and let it cook overnight. It turned out perfect! Add all ingredients, except rice, to the slow cooker. Cook on low for 8-10 hours, or high for 3-4 hours. After it is done cooking, stir in the cooked rice. Serve hot. 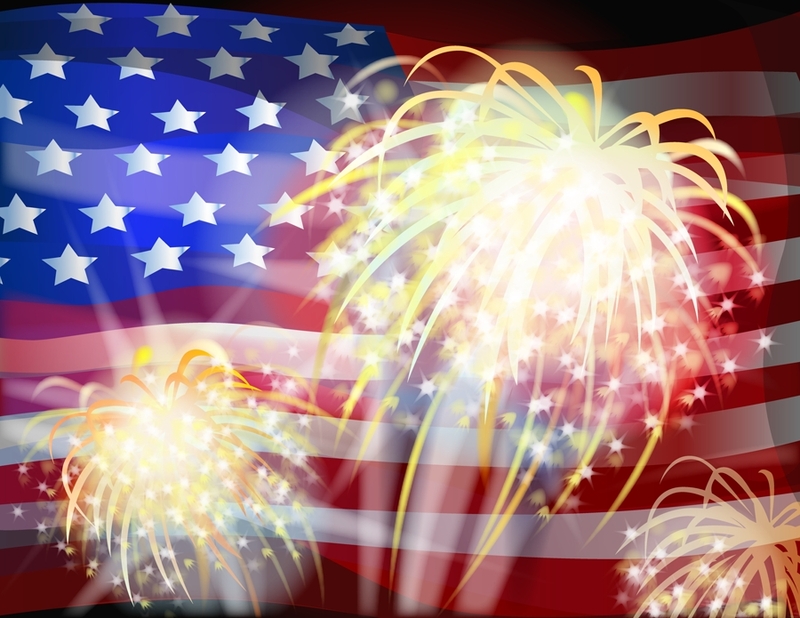 Today is a day we celebrate our freedom in the USA. So, I planned to make a little extra food today in celebration. We had invited a friend over to join us, but he ended up cancelling. We had a ton of food ready to go, but the extra will take us through the next few days with some spin-off dishes. So, what did we have? 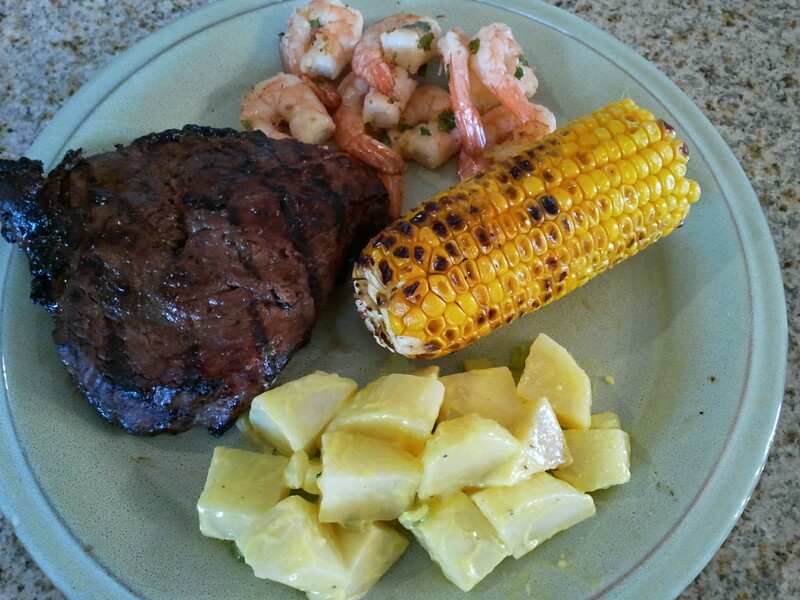 We had top sirloin steaks, which I got on sale for $3.99/lb at Safeway last week, that I marinated in Dale’s Seasoning. The shrimp was from Zaycon Foods, and I marinated to give it a spicy, garlic, lime flavor (see recipe below). 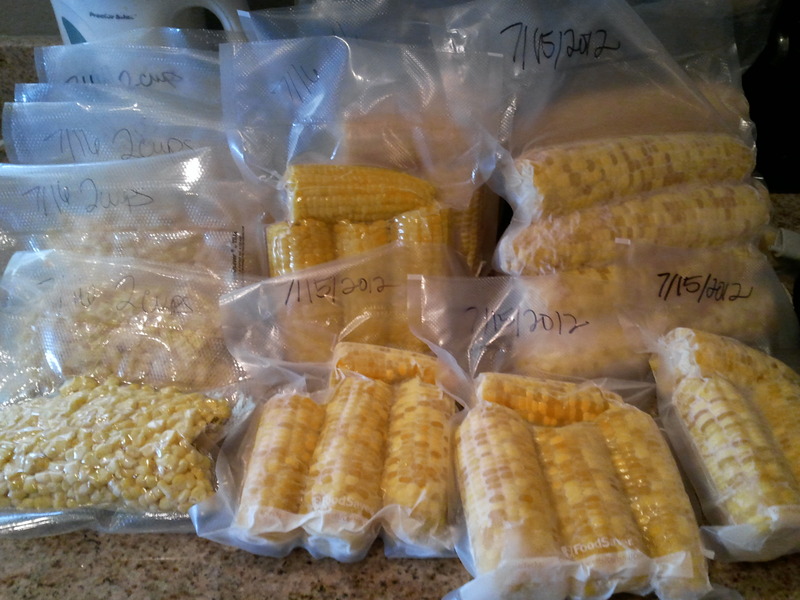 I also grilled corn on the cob, and to do that I cut each corn cob in half, sprayed with olive oil, sprinkled a little salt and ground black pepper on, and wrapped in aluminum foil, and put on the grill for 10-15 minutes. Finally, I made a potato salad. Unfortunately, I was in a bit of a hurry and didn’t cook the potatoes quite right and so they were a little crunchy, but the rest of the taste was right on. This recipe called for sweet relish and onion, so since I had made Refrigerator Pickles a couple days ago, I chopped up the onions and “pickles” to add to the potato salad. The recipe for this is below as well. I have quite a bit of steak and corn left, so I am thinking I will cut up the leftover steak and saute with green peppers and onions to make steak fajitas. 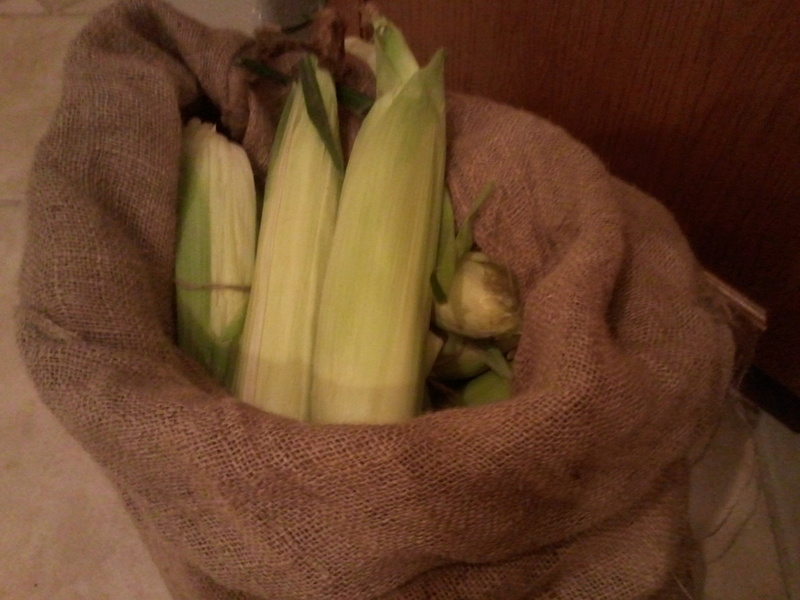 Then, I will use the corn to make Roasted Corn Salsa as a side to go with it. I also made a few extra hard-boiled eggs when I boiled eggs for the potato salad, so I chopped them up and chopped up more of the onions and pickles to mix in with it, and then mixed in some mayonnaise and mustard to make egg salad for sandwiches for lunch tomorrow. 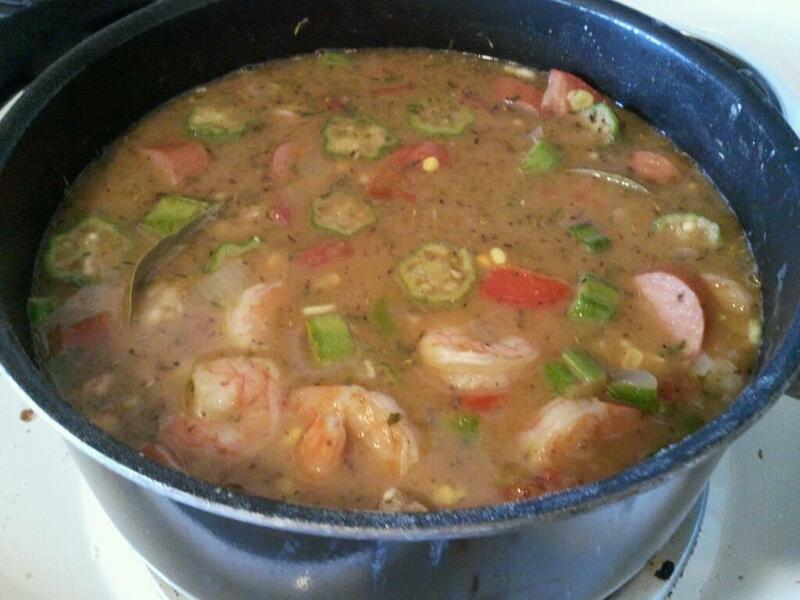 Mix together all ingredients, and toss to coat shrimp well. Place in refrigerator for 30 minutes. Option 1: Place shrimp on metal skewers. If using bamboo skewers, soak the skewers in water while the shrimp marinades. Heat a grill to high and lightly oil the grate. Place shrimp on grill and cook for 2-3 minutes per side. Option 2: Heat a large skillet on the stove to medium high heat. Pour contents of bowl into the skillet. Stir, and cook about 5 minutes, just enough to heat shrimp through. Peel and chop potatoes. Place in a large pot and cover with cold water. 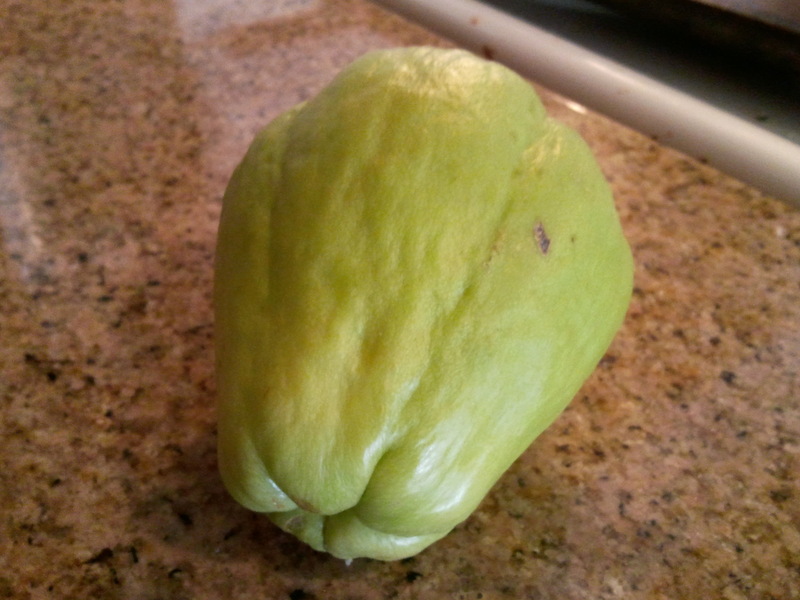 Place on stove and bring to a boil. Boil for 15-20 minutes, until potatoes are tender, but not mushy. Drain water and allow to cool. 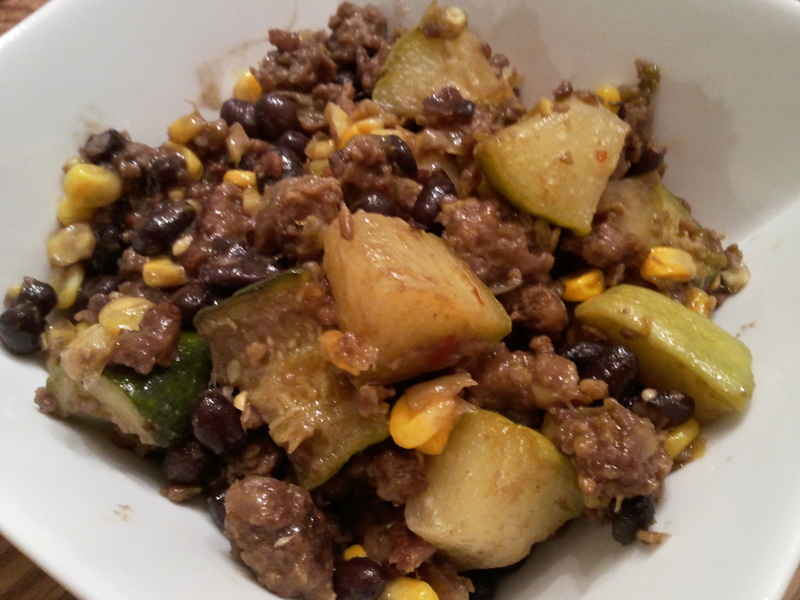 In a large bowl, combine the potatoes and the rest of the ingredients. Stir well. Chill in refrigerator before serving.